It wasn’t so long ago when women undergoing a hysterectomy faced a long, painful recovery, weeks of recuperation and an ugly scar across their bellies. Today, advanced robotic technology has made it possible to perform the surgery through a single small incision in the navel, speeding up healing and leaving patients with hardly a blemish. Four Beaufort Memorial Hospital gynecologists are among the first physicians in the country performing the state-of-the-art procedure using an advanced version of the da Vinci Si Surgical System and new instrumentation designed specifically for single-incision surgery. For Jamison, it was the quick and easy recovery that sold her on the procedure. She was able to return home the same day of surgery and had no need for pain medication by the following afternoon. Hysterectomy, the surgical removal of the uterus, is the second most common surgery (after cesarean delivery) among American women. Some 600,000 hysterectomies are performed annually in the United States. By age 65, one in three women can expect to have a hysterectomy, according to the U.S. Department of Health and Human Services. Up until the early 1990s, hysterectomies involved major abdominal surgery, requiring a five- to seven-inch incision, either up and down or side to side across the belly. The procedure typically requires a four-day hospital stay and six weeks of recovery. Even after the advent of laparoscopy, open surgery remained the most common approach to hysterectomy, accounting for about 65 percent of all procedures. 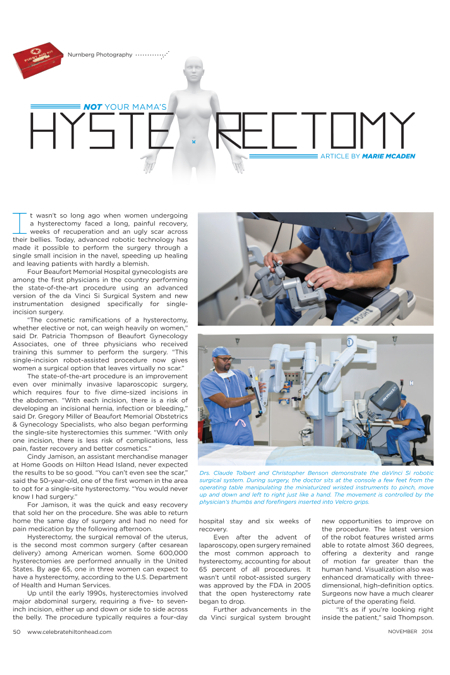 It wasn’t until robot-assisted surgery was approved by the FDA in 2005 that the open hysterectomy rate began to drop. Further advancements in the da Vinci surgical system brought new opportunities to improve on the procedure. The latest version of the robot features wristed arms able to rotate almost 360 degrees, offering a dexterity and range of motion far greater than the human hand. Visualization also was enhanced dramatically with three-dimensional, high-definition optics. Surgeons now have a much clearer picture of the operating field. “It’s as if you’re looking right inside the patient,” said Thompson. The increased precision of the new model made it possible to equip the robot with more advanced instruments. It wasn’t long before Intuitive Surgical Inc., developers of the da Vinci, introduced FDA-approved single-site instrumentation. Beaufort Memorial purchased the new technology last year and began using it for gallbladder surgery. In July, Drs. Thompson, Miller and Christopher Benson received training to perform hysterectomies with the device. A fourth physician, Dr. Claude Tolbert, was trained in October and has begun performing the surgery as well. Drs. 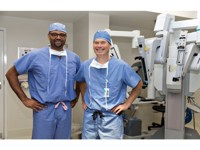 Claude Tolbert and Christopher Benson (pictured above), along with their Beaufort Memorial colleagues Patricia Thompson and Gregory Miller, are among the first surgeons in the country to perform the new single-site hysterectomy procedure. Thompson is with Beaufort Gynecology Associates and Miller, Benson and Tolbert are all part of Beaufort Memorial Obstetrics & Gynecology Specialists. 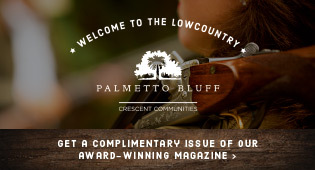 All four physicians are board-certified and see patients in both Bluffton and Beaufort. Last month, Intuitive Surgical Inc. received FDA clearance for a single-site wristed needle driver to facilitate suturing after removal of the uterus. It can move the instrument tip up to 45 degrees in all directions for precise needle positioning. For more information on single-site hysterectomy, visit beaufortmemorial.org or call (843) 522-5585.